Good morning. Thank you for the introduction and for the invitation to visit. Here's a brief outline of what I'll be covering in my talk. As well as my thoughts on why I think SIAT is the best place for me to do this research. · Workflows for Energy Portfolio Analysis J5 Publications since 2013 by chronology + type as listed in my CV | WP* = working paper. And here I've sorted my publications in a way that best matches the topics that I'll speak about today. · Workflows for Energy Portfolio Analysis J5	Publications since 2013 by chronology + type as listed in my CV | WP* = working paper. So I've dimmed out the publications where the first author was a PhD intern or another collaborator. I'm going to focus on the three projects highlighted in gold. Though I'll briefly mention some of the other projects where appropriate. From the perspective of an information visualization researcher. And I've presented much of it at the IEEE InfoVis conference. · Combining visualization, annotation, and explanation to present information to an audience. · Thinking systematically about tasks, design choices, and constraints. · Identifying ways to assess alternative design choices. And of course disseminating the results of these assessments. e.g., Hans Rosling's TED presentations about global economic and public health indicators. Image: Open Knowledge Foundation Deutschland (flickr, cc by). I'm particularly motivated by the challenge of presenting information to a large public audience. Where I might use visualization to tell a richer story that is grounded in data. Some great examples of this process in action include a series of TED conference presentations by the late public health expert Hans Rosling, who you see here. More broadly, this process of combining visualization and narrative explanation has become common in the fields of journalism, education, and public policy. Information that is personally-relevant and appropriate for the context. e.g., Mobile news; apps for tracking personal activity, health, finance. Image: newkemall (flickr, cc by). Where the individual can't ask the designer or presenter for clarification. Inspired by use cases in mobile news consumption and by apps that present personally-relevant information. Such as those involving personal activities, health, and finance. Thinking systematically about tasks, design choices, and constraints. So what do I mean when I say that expressive information design means thinking systematically about tasks, design choices, and Constraints? A Multi-Level Typology of Abstract Visualization Tasks. Brehmer and Munzner. In IEEE Transactions on Visualization and Computer Graphics (InfoVis 2013). Icons by Eamonn Maguire (cc by) for Munzner's Visualization Analysis & Design (CRC Press, 2014). Which is the subject of a 2013 paper written with my PhD advisor Tamara Munzner. And by this I refer to both the tasks of an information designer or author, as well as the tasks of a viewer, or what the audience is expected to do with the information presented to them. Such as to identify a trend or to compare values. And whether this story can be reconstructed in the mind of the viewer. In IEEE Transactions on Visualization and Computer Graphics (InfoVis 2013). The most cited IEEE InfoVis paper since 2013, with more than 280 citations*. * Google Scholar, Jan 2019. Icons by Eamonn Maguire (cc by) for Munzner's Visualization Analysis & Design (CRC Press, 2014). This task typology paper also presents a way to break down tasks and task sequences into elements of why visualization is used, what the inputs and outputs are, and how the task is realized in terms of design choices. And you'll see this systematic thinking about tasks throughout my work. As my task typology paper has gone on to be the most cited InfoVis paper since 2013, now with more than 280 citations. ... ways to visually represent data. ... ways to interact with these representations. ... ways to highlight and annotate them. ... ways to combine visual content with textual explanation. In an expressive information design tool, how do you present these choices? Or ways to combine visual and textual explanations in compelling and engaging ways. For example, as a designer are you controlling low-level visual encoding channels like shape or color, or are you picking a chart type from a template? As you'll see this process identifying and assessing points in the design space in the two focus sections later in this talk. Constraints imposed by authors, by the audience, or by the context. Expertise: empowering non-programmers and non-designers. Resources: enabling expressive information design for those on a deadline. Literacy: anticipating the visual and data literacy of the audience. Device: anticipating the audience's viewing experience. Expressivity is also bound to constraints, and it is these constraints that I find to be particularly challenging and deserving of research. And these include constraints imposed by designers or authors, as well as those imposed by the audience and the context in which the information is presented. I want to empower non-programmers to present information with interactive visualization and presentation tools. And I want to empower non-designers to make compelling and useful information graphics by offering design guidance. For example, I want to enable over-committed, understaffed, and poorly funded local news teams to produce data-driven stories about their community while meeting all their deadlines. What if my audience lacks the sufficient visual literacy or data literacy needed to interpret my particular choice of visual representation? How can I make use of their prior knowledge as part of the communication process? << CLICK >> And finally there's the device: what if my audience is consuming this information from a mobile device? How does that constrain my choices? As well as how I would situate my research and why I think it's important. And an undergraduate program in Computing with a specialization in Cognitive Science. · Laboratory experiments | Crowdsourced experiments | Statistical analysis * See the Design Study Methodology by Sedlmair, Meyer, and Munzner. In IEEE TVCG (InfoVis 2012). I design and build things! as well as software development for a deployed product, a research toolkit, and various visualization tools and experimental applications. Which involve everything from content analysis to requirements analysis and usage analysis of deployed visualization tools. This qualitative work also contributes to theory development, where I've systematically collected and categorized previous research as well as information design content by practitioners. You'll see me touch upon many of these methods as well as the need for methodological innovation throughout the rest of this talk. Produce and present compelling data-driven stories? Make personal decisions grounded in data? As well as giving people well-designed and contextually-appropriate information tools that help them to make decisions that are relevant to their personal lives. Situating my research within the academic visualization community. Considering applications of visualization beyond those in professional data analysis. e.g., Why are journalists and educators presenting information using business intelligence tools? e.g., What are the best practices for the visual display of personal-relevant information on a phone? And its here that I situate my research from that of others in the broader visualization community, such as those working in visual analytics like Brian. Many in the visualization and visual analytics research community are motivated by use cases from professional data analysis, data science, or business intelligence. While I think these use cases are important and I'm glad that people are thinking about them, they are NOT the use cases that motivate my research. Instead, I'm interested in incorporating visualization to present information to people who don't identify as data analysts, in both public and personal contexts. This leads me to ask questions like ``why are journalists and educators are using business intelligence tools to present information to their audiences``? Can I build better tools for these communities and their needs? Or can can I identify best practices for the visual display of personal information on a mobile phone? Disseminating visualization research into practice, and vice versa. Promoting and studying the adoption of deployed information design tools and research prototypes. Collecting examples of information design produced by practitioners. Fostering a dialogue between researchers and practitioners (e.g., OpenVisConf, VisInPractice)*. * OpenVisConf: openvisconf.com | VisInPractice event at IEEE VIS: VisInPractice.github.io . Finally, increasing expressivity and democratizing visualization are only possible if there is an ongoing process of communication and outreach between visualization researchers and practitioners. This means disseminating research into practice, and just as importantly, disseminating practice into research. As you'll see in my own research, this manifests as studying the adoption of deployed tools and prototypes. And collecting examples of information design produced by practitioners. Or how I co-organized the VisInPractice event at last year's IEEE VIS conference, where I invited prominent visualization practitioners to speak to a largely academic audience. · What is expressive information design? Brehmer, Lee, Henry Riche, Tittsworth, Lytvynets, Edge, and White. In Proc. Comp. + Journalism 2019. Which I'll be presenting later this week and the Computation and Journalism Symposium in Miami. You could think of it as PowerPoint for timeline data. which is a popular interactive data analysis, visualization, and presentation tool. But before I speak more about this tool and its evaluation, I'll provide its back story and motivation. Brehmer, Lee, Bach, Henry Riche, and Munzner. In IEEE TVCG (presented at InfoVis 2017). Timelines are visual representations of categorical event sequences. How have people drawn timelines over the course of history? The visualization research community has focused on their use in data analysis. How have practitioners used them for storytelling? Which are used to tell stories in domains such as journalism, education, and project management. I began collecting and systematically categorizing how people have drawn timelines over the course of history. I did so upon realizing that prior visualization research involving timelines had focused on their uses in data analysis, such as for understanding patterns in electronic health records. And because of this focus, the expressive range of design choices considered by the research community was far smaller than the range of design choices considered by the design and practice community. Did A and B co-occur or repeat? Why do we draw them? And why do people find them interesting? Basically, a timeline communicates to the viewer "WHAT HAPPENED WHEN". As well as when events occur relative to some baseline event. It turns out that there are many ways to answer these questions and present timelines, which brings me to my design space. 1. Collecting and categorizing 145 timelines and timeline tools to establish the dimensions. · Sources included: Cartographies of Time (Rosenberg & Grafton), Visualization of Time-Oriented Data (Aigner et al. ), Making Timelines (Groeger). 2. Validating the dimensions of the design space with 118 additional timelines (263 total). · Sources included: visual.ly, the Kantar Information is Beautiful Awards showcase, massvis.mit.edu. 3. Implementing points in the design space with 28 representative datasets. · e.g., Conflicts, epidemics, lifespans, head of state tenures, news stories, natural disasters, publication records, geological history. So how did I come up with this design space? And out of that came the dimensions of the design space. Next, I verified that the design space could be used to label 118 additional timelines drawn from collections of practitioner work. Lifespans, news stories, natural disasters, publication records, and extremely long-spanning timelines of geological and astronomical history. timeline designs at timelinesrevisited.github.io . Purposeful in terms of their communicative intent, interpretable in terms of which perceptual task the viewer is expected to make, and generalizable across a range of timeline datasets. And a characterization of the viewer's task. Altogether this is an instance of the systematic thinking about tasks and design choices that I mentioned during the introduction to this talk. So now that I've given you all of these design choices, how do you use them to tell stories with timelines? In other words, how do you combine different points in this design space? Many existing timeline presentation tools will limit you to linear representations and chronological time scales. In this TVCG paper I make the case that timeline design tools should provide alternative representations of time and alternative time scales. Either the whole timeline is shown as a static image, so readers are likely to begin at the start of the timeline, or events are revealed in chronological order, one event at a time as a series of slides. I demonstrated it at the Tapestry Conference and OpenVisConf in 2017. My co-author (White) used it in his 2017 Dublin Data Summit keynote. Microsoft's Data Journalism Team demonstrated it at the 2017 Future of Storytelling Summit. I wrote about it on the official Power BI Blog. I co-produced a tutorial and interview for the Power BI YouTube channel. Which reflects my value statement I mentioned earlier about connecting research and practice. My colleagues at Microsoft also contributed to this effort to attract users with their own demonstrations and presentations. A customer demonstrated it in the opening keynote of the 2017 Data Insights Summit. But the real break came when Power BI decided to feature a live demo of Timeline Storyteller in the opening keynote of the 2017 Data Insights Summit, a major Microsoft customer conference. So while I sat nervously at the back of this auditorium, the demo proceeded and thankfully it didn't break and the audience seemed to be quite impressed. I collected exported content from the web version. I collected entries from a data storytelling contest with the Power BI user community. I tracked download metrics of the Power BI desktop version. Example entries from the Power BI user community data storytelling contest: Tropical Cyclones by Manga Solutions. | TV Network Ratings by Pragmatic Works. Over 36,000 downloads of the Power BI version. Over 51,000 views of our YouTube tutorial. Over 150 stars of Github repository. Finally, I had coarse quantitative metrics. In summary, Timeline Storyteller fills a gap in that no existing tool allows a non-programmer to present a visually expressive timeline narrative. ChartAccent: Annotation for Data-Driven Storytelling. Now I'll step back to mention that Timeline Storyteller is just one of the expressive information design tool research projects that I've contributed to over the past couple of years, with PhD interns leading their development. And we learned about these practices by collecting and categorizing over a hundred examples. Charticulator: Interactive Construction of Bespoke Chart Layouts. Ren, Lee, and Brehmer. In IEEE TVCG (InfoVis 2018). Honorable Mention for Best Paper at IEEE InfoVis 2018. Shortlisted for the 2018 Kantar Information is Beautiful Awards. Which is a bit like the academy awards of information visualization. DataToon: Drawing Dynamic Network Comics With Pen + Touch Interaction. Where you can drop network data into a canvas, get recommendations for panels, position panels with touch, and annotate and style nodes and edges with the pen. And I should mention that limiting the interaction to pen and touch was a fun and challenging constraint. Or about how I can empower people to create useful and relevant presentations of information without having to know how to program or be visualization experts. And I've told you about ways that designers can capture attention and incrementally reveal information while maintaining coherency story. And it's a very common constraint in 2019: the audience is not using a desktop display. They are on their phone. Brehmer, Lee, Isenberg, and Choe. In IEEE TVCG (InfoVis 2018). And its origins came during demonstrations of Timeline Storyteller to a group at Microsoft designing personal health apps. They asked me "will this work on mobile? ", since they were designing mobile apps involving time-oriented personal activity data, namely sleep data. Like with the timeline project, I started this one by looking to current practice and how designers currently visualize data on mobile phones. Image: Eric Boam's 7 Months of Sleep. Consider Eric Boam's "7 Months of Sleep" project, in which every day he indicates the hours slept, with bedtimes at the top and waking times the next morning at the bottom. I realized that this form of data can be abstractly characterized as a series of ranges over time, with each range having a high and low value, in this case corresponding to bedtimes and waking times. Image: The New York Times (June 4, 2017). I then realized that temperature data is abstractly similar and presented in the same way, albeit with high temperatures at the top and low temperatures at the bottom. Here's an example from the print edition of the New York Times. Highs and lows for the last five days and the next five days are shown for 22 American cities, and you'll also get a full month of temperature ranges for New York City itself. Images (clockwise from left): The New York Times · Eric Boam · Randy Olson. These examples work well in print and when shown on large displays, but that's not how many of us now consume weather data or personal health and activity data, such as sleep duration. Instead, these and several other sources of range data are likely to be consumed from a mobile device. Apps: Dark Sky © · Weathertron © · Weather Line ©. So what does current practice look like? There are weather apps like these that display ranges for 7 or 10 days or aggregated across 12 months. Apps: Azumio Sleep Time © · Garmin Connect © · Bedtime (iOS Clock) ©. And similarly there are ranges shown in sleep tracking apps such as these, with weekly or monthly time window options. Image: Weather Radials (by Timm Kekeritz) ©. As you recall from the timeline project, time is also cyclical; we experience seasons, lunar cycles, and weekday/weekend routines. This is nicely captured here in this project by Tim Kekeritz called Weather Radials, in which temperature ranges are drawn radially. Images: mobileinfovis.com by Sebastian Sadowski, 2018. But are radial designs appropriate for mobile displays? It would seem as though mobile app and website designers appear to be quite fond of radial representations, as indicated in this mobile infovis survey by Sebastian Sadowski. The first crowdsourced visualization evaluation study performed exclusively on phones. Image: newkemall (flickr, cc by). The answer to how many ranges can be fit into mobile display and to whether you should use a linear or radial representation is of course, "it depends on the data and the task". I know this because I conducted a crowdsourced quantitative experiment in which I asked crowd workers to perform a set of different tasks on their mobile phone. This is really the first time that anyone has done a crowdsourced visualization evaluation or graphical perception study exclusively on mobile phones. My experiment's stimuli involved both linear and radial representations, as well as three granularities of time: a week of 7 seven ranges, a month of up to 31 ranges, and a year of 365 ranges. Tasks derived from A Multi-Level Typology of Abstract Visualization Tasks. Though within each task I counterbalanced the presentation of representation and granularity, with several trials for each combination. I asked participants about their preference and their overall confidence in their responses for each combination of representation and granularity. 84 trials per participant, using their own phone. Though I excluded results from 13 participants, due to non-completion, non-compliance, or for failing to correctly respond to quality control trials distributed throughout the experiment, which is typical of Mechanical Turk. They had to use their own mobile phone running a recent version of iOS or Android. Brehmer, Lee, Isenberg, and Choe. In IEEE TVCG (InfoVis 2018). aka.ms/ranges-tvcg . People are, in general, slower with radial representations. e.g., less accurate with radial when identifying and locating values in absence of seasonal variation. People prefer and are more confident with linear representations. In the interest of time, I won't get into the detailed stats including confidence intervals and effect sizes for each task, which you can find in the paper; for now, I'll stick to high-level results. In general, people tend to be slower with radial representations, irrespective of the source of the data. However, radial representations don't seem to incur accuracy costs, at least with temperature range data, where there tends to be a lot of seasonal variation. With sleep range data, which exhibits no seasonal variation, people are less accurate when identifying values or when locating extreme values. It's also worth remarking that participants universally preferred linear representations, and they felt more confident using linear representations relative to radial ones. Altogether these findings are interesting given the popularity of radial representations of time in practice and design communities. The other primary question in this study is how many ranges can you fit in a mobile display and still retain reasonable task performance, such as when you jump from a week of 7 ranges to a month of 31 ranges to a year of 365. You might expect that adding more marks in a chart will incur worse performance, but again the results are more nuanced. People are typically slower with a month than with a week of ranges. For some tasks, people were less accurate with a month than with a year. e.g., seasonal variation in annual temperature appears to be beneficial for locating extreme values. but they weren't that much slower when they moved from a month to a year. With regards to accuracy, the jump from a week to a month only incurred noticeably worse performance when locating extreme values. Interestingly, there were cases where people were as accurate or even more accurate with a year of ranges than with a month of ranges, particularly among those looking for extreme temperatures. Where it would seem as though the expected seasonal trend of temperature ranges appears to make the task easier relative to examining a month of sleep ranges. Temperature (L) and Sleep (R) don't follow monthly cycles. And we tend to have a weekly sleep routine across weekdays and weekends, as opposed to a monthly sleep routine. What's interesting here is that many health and sleep tracking apps have a month or 4-week time window setting. Is a cycle meaningful in the context of the data? Does the task involve locating values? Or comparing them? Locating values quickly? → Choose Linear. Comparing values (and unconcerned with speed)? → Choose Radial or Linear. As for conclusions, the questions of which representation and which granularity to display are really questions about congruence between these design choices and the combinaation of data and task. And whether task efficiency is the first priority. More research is needed to assess visualization design choices on mobile phones. aka.ms/ranges | (mobile only) experimental app. github.com/Microsoft/RangesOnMobile | open source app and analysis. medium.com/multiple-views-visualization-research-explained | blog post for practitioners. though substituting different data and chart types. So that they can put my findings into action. At this point I'd like to speak about my ongoing and near-term future work, and then I'll close with a higher-level vision of my research opportunities in the years to come. For Trend Visualization on Mobile Phones. Brehmer, Lee, Isenberg, and Choe. Working paper, Jan. 2019.
aka.ms/multiples | (mobile only) experimental app. I have a working paper that I'll be submitting to VIS this year which I can send you. Discoverable Interactions for Navigating & Selecting Time-Varying Data on Mobile Phones. Brehmer, Lee, Collins, and Hinckley. Motivation: few people interact with interactive news graphics beyond scrolling. Many interactions anticipate a desktop context, but most of the audience is using a mobile device. UI elements for navigating multidimensional time-varying data occupy too much screen real estate. Meanwhile, I've also been developing novel techniques for interacting with representations of time-varying data on mobile phones. Despite the presence of additional interactivity. So in this project I've been assessing alternative interaction techniques that aim to be discoverable while conserving precious screen real estate. Smaller Multiples: Assessing Multidimensional Glyph Design on Mobile Phones. Brehmer, Lee, Isenberg, and Choe. Images CW from top left: StressScan, Clue, FitBit Surge, Activity, Sleep++, Daily Goals. And I'll likely use a similar crowdsourced experimental protocol to the ranges and animation studies that I've told you about. The Performative and Whimsical Drawing of Timelines with Pen + Touch Interaction. Images L to R: narrative diagram by Kurt Vonnegut, "board game"-like timeline by Matthew Lee, timeline by Mark Twain, a curve timeline in Timeline Storyteller. I'm also continuing to do research about expressive information design tools. My colleagues in the HCI group at Microsoft are some of the leaders when it comes to pen and touch interaction design, and I've collaborated with them already on two projects that unite pen + touch interaction with expressive information design. I plan to investigate the potential of pen and touch interaction for drawing and annotating timelines, particularly in the context of live presentations and in application domains such as education. What I've spoken about today can be situated within a longer-term research agenda in expressive information design. Designing and evaluating inviting and memorable techniques for presenting information. Widening the scope of data types: e.g., spatiotemporal data, dynamic networks. Collecting and assessing design choices from the research and practice communities. In both quantitative experimental studies and by qualitatively examining their usage in the wild. Measuring audience graphicacy* (visual / data / statistical literacy) and identifying ways to boost it. Information design for an audience with a limited attention span. Mobile-first and mobile-only information design (and addressing the scarcity of research). More laboratory- and crowd-based experimental work to assess alternative design choices. * Uncertainty, graphicacy, and the power of statistics. Alberto Cairo (Oct 18, 2017), thefunctionalart.com . Such as their limited "graphicacy", which is how renowned journalist and author Alberto Cairo refers to the combination of data, visual, and statistical literacy. I want to identify how to measure this construct as well as how to improve it. There's also the constraint of the audience's limited attention span and the challenge of designing information that both attracts this attention and yet does not mislead or misinform. Finally there's the constraint imposed by small displays, which motivates me to identify where the limitations are for visual representation and interaction design choices. And I'll reiterate that there's not a lot of prior research from the visualization community when it comes to mobile devices, and I plan to fix this. And for each of these constraints, I believe more experimental work is needed, both in the lab and with online crowd worker participants. Individuals: Visualization of personally-relevant information for making decisions in daily life. Recomendations and considerations for those without design expertise. e.g., small or local newsrooms, educators, cultural institutions, curators of digital collections. For individuals this means applications for visualizing personaly-relevant information for making decisions in daily life. And instead offeriung an interactive experience that provides both expressivity and design guidance. And now, why do I think SIAT is the place to do my research? · Students trained in information design, visual communication design, and interaction design. · Potential to collaborate on projects on resource conservation, health, and cultural heritage. · Research spanning interactive computing, design, people, & the science of interaction. · Cascadia (Vancouver, Victoria, Seattle) is the world's best place to do visualization research. · It is the ideal place to establish an Expressive Information Design group. The students here are trained in subjects that I care deeply about, such as information design, visual communication design, and interaction design. Second, there are opportunities to collaborate with faculty members in application areas of mutual interest, such as resource conservation, health, and cultural heritage. Interactive computing, design, people, and the science of interaction. And finally because the greater Vancouver area and Cascadia by extension has become the hub for visualization research, providing opportunities to collaborate between SFU, UBC, UW, and UVic, as well as industry connections to places like Microsoft and Tableau. And thus I think it is the ideal place to establish an expressive information design group. Which includes visiting faculty researchers and PhD interns. Reflecting on the Evaluation of Visualization Authoring Systems. Ren, Lee, Brehmer, and Henry Riche. In Proc. BELIV 2018 (Evaluation and Beyond - Methodological Approaches for Visualization). Lessons from evaluating tools incl. Timeline Storyteller, ChartAccent, & Charticulator. Emphasis on post-deployment content analysis and chart reproduction studies. The evaluation of Timeline Storyteller and these other expressive information design tools has also allowed me to reflect on the methods for evaluating them. And so I recently contributed to this BELIV paper, where BELIV is a VIS workshop dedicated to evaluation methods for visualization. As well as on the chart reproduction studies that we performed for ChartAccent and Charticulator, in which we asked study participants to reproduce a completed chart using the tool. Evaluating Data-Driven Stories & Storytelling Tools. Amini*, Brehmer* (equal contribution), Bolduan, Elmer, and Wiederkehr. In Data-Driven Storytelling (CRC Press 2018). A summary of perspectives, criteria, methods, metrics, and constraints w.r.t. evaluation. 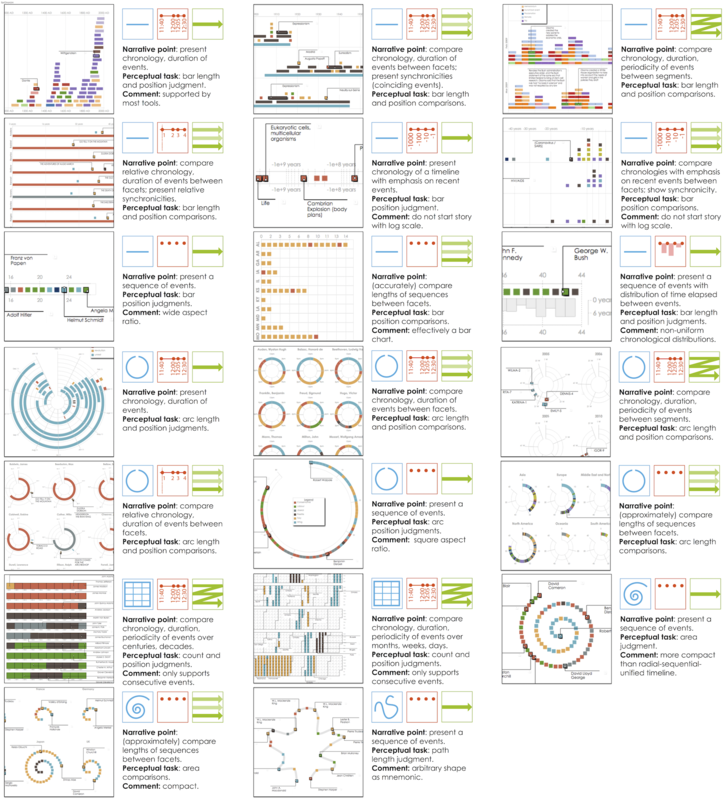 How the visualization community should evaluate data-driven stories more generally. Consider a story that makes use of visualization, text, and potentially interaction. It might incorporate many design choices, in that the author was highly expressive; but was it any good? My co-authors and I attempted to catalog all the ways you might evaluate this form of content. And another was Benjamin Wiederkehr, who leads the Interactive Things information design firm in Switzerland.